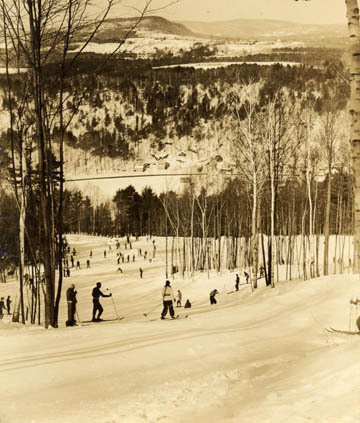 Beartown Ski Area was a classic, and somewhat long lived CCC area that was originally built as a Ski Train Destination. 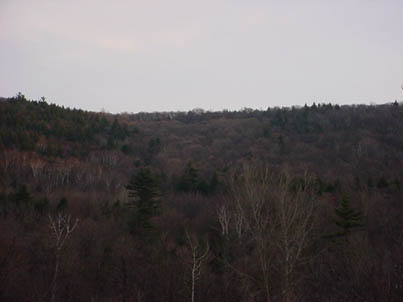 It was also one of the largest areas to close in Massachusetts (820' drop)- only Brodie Mountain had a larger one (~1250'). With three rope tows and about 10 trails at its heyday, it was quite the happening place. NELSAP is grateful to Alec Gilman, MA Department of Conservation and Recreation, who has provided us details on the mountain's early history including some very rare photos (credit for following three), which are all courtesy of the DCR Archives. 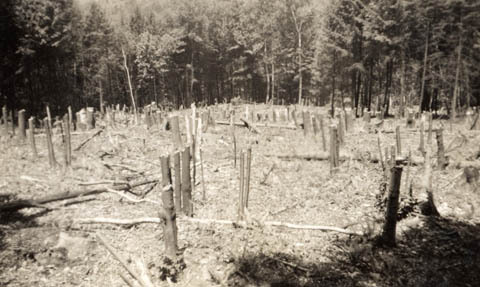 Beartown's genesis begins in 1935, when the CCC begain clearing trails and slopes at this area. To the right shows one slope in 1935 being cleared. Two rope tows were built, the longest was 1500' and served a 380' drop. The longest served the Polar Slope and Sedgewick Slope, while the other one was a beginner trail which served a beginner slope. Other trails were cut above the long tow - Grizzly and Kodiak. These were not served by lifts but required a hike, about 440' of vertical upwards. In its later years these would be fully lift served. To the left shows a 1936 view, likely the first winter, of the Polar Slope. Looks like a snowy day, and the slopes are packed! To the right shows likely the Polar Slope from higher up, circa 1937. This looks down on Rte 102 and South Lee. Again, notice the area was fully crowded and the snow is deep. Snow trains would frequent this area, as a railroad station was quite close to the area. These Snow Trains were mainly from New York City. It is unsure whether or not this area remained open thru World War II. The area operated under the original operators (unsure of exact details) in the late 1940's into 1951. In 1951, Al Prinz, who also operated nearby Oak N Spruce, took over operations. He added a summit tow sometime between 1951 and 1953, which served the expert Kodiak and Grizzly trails. A new trail, Panda Road, was built from the summit to base, and provided a low-intermediate way down. (Click for larger) Here's the trail map from 1953 magazine "Ski Time". You can see the shortest tow at the bottom right, also known as the Novice or Cub Tow. This served a beginner slope only. The "Lower Tow" servied the twisty 1/2 mile intermediate Sedgewick Slope and the fairly wide Lower Polar Slope. Two "escape routes" are evident on this map for fallen skiers who rode the tow. Also note that the lodge was not at the bottom but rather halfway up the Lower Polar Slope. Further up the mountain was the Upper Tow, which was quite steep. Keep in mind this ski area was quite steep, the upper two thirds were quite challenging. This tow served Grizzly and Kodiak, which were 1/2 mile long expert runs. Upper Polar Slope was served, which was in total 1 mile long. Panda Road was a low intermediate 1 mile long run. Since Al Prinz took over the management of Beartown Ski Area in South Lee, big things have been stirring in that neck of the Berkshire Woods. Two new tows have been constructed, one a 1200 foot connecting tow that goes to the very top of Beartown, giving South Lee Visitors a choice of five trails and two open slopes with an 820 foot descent. The run from the top is all an expert could desire and intermediates find it within their capacity if they do a few extra Christies. The new upper tow was cut through difficult terrain and much of the new line was blasted through rock to make the proper contour. Now, for the first time, the famous 2500 foot long Grizzly racing trail is easily accessible via tows. Another trail served by the tows is the Kodiak, an expert trail comparable to the Grizzly, also 2500 feet long. For intermediate skiers, the Polar Trail now is a real thrill with a run of more than a mile. 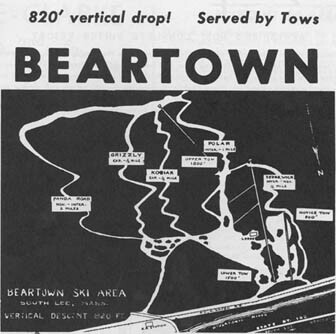 Beartown ski area is in the heart of the Berkshire snow belt. Winter snow reports are printed in metropolitan newspapers to give you up to date last minute snow conditions. Located in the central Berkshires, BEARTOWN is an accessible major ski center just an hour or two drive from many metropolitan areas. One day trips are often made by many groups because Beartown's proximity allows many good hours of skiing. Avoid those long tedious drives and ski at the easily accessible BEARTOWN SKI AREA. "Following many years of operation by Albert S. Prinz, owner of the nearby Oak ‘n Spruce Lodge, during the period from about 1955-1961 the ski area appears to have been inactive. Prinz, due to other business obligations was unable to commit to operation and was planning to sell the ski tow equipment or find another interested tow operator. Lack of good snow cover was another reason. 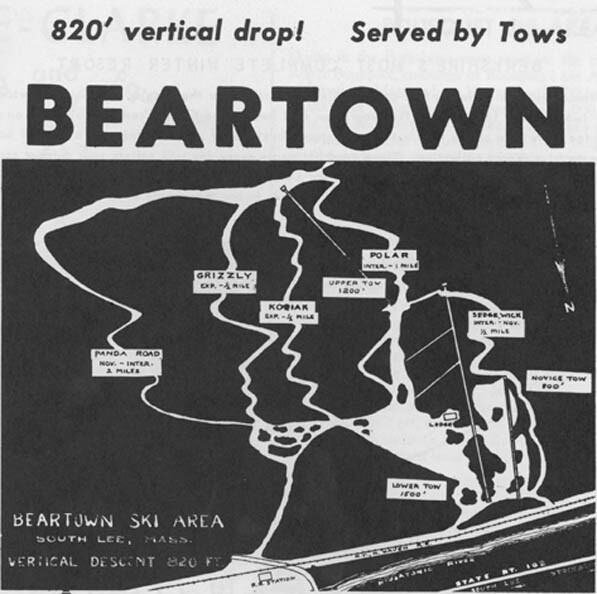 The area was reactivated from January 1961-1966 through the operated by William T. McCormack president of Beartown Associates, Inc. otherwise known as the Beartown Ski Club, Inc a non-profit organization to provide low-cost skiing. 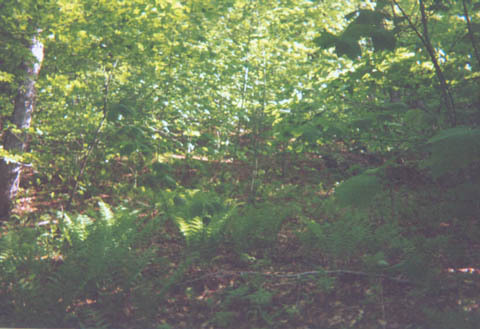 As far as I can see, the area was unused after 1966 eventually reverted to forest." After 1966, the area did grow in, however it was possibly used by picknickers in the 1970's. By 2005, the area was hardly noticeable and was nothing for than a fond memory. However, lift lines are still clear and some trails can be faintly seen if you know where to look. Also, the fireplace from the lodge still stands. To the right is a Terraserver shot of the area. Its almost totally grown in. However, with some scrutiny, one can discern features. Compare this to the 1953 trail map. A - Upper Tow. B - Lower Tow. C - Sedgewick Slope. D - Lower Polar Slope. E - Beginner Tow. F - Kodiak Trail. G - Grizzly Trail. 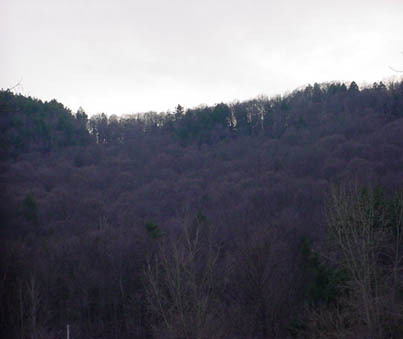 Scott Jervas: I recently found Beartown Ski Area in Beartown State Forest . I grew up on the border of the forest on the other side and never knew about the area until I read about it on your site. I attached a map with a red star at the entry point to hike into the area (below). 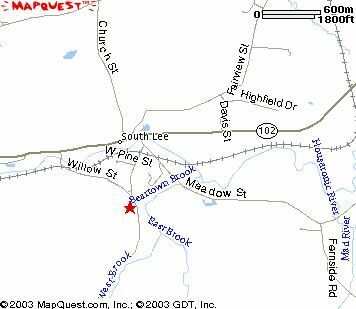 To get to the area, head east on rt.102 out of Stockbridge MA. You’ll soon see a paper mill on your right, the area is actually up on the mountain behind the mill, but I don’t think there’s an easy access point at the mill. Keep going past the mill and take the next right, there may be a sign to Oak and Spruce resort there. Immediately after making the turn, bear right (not left on Meadow Street to Oak and Spruce). As you go up the hill there will be another fork, bear left. On the left there will be a brown house, then a small pull-off area, you can park at the pull-off. Opposite the pull-off (on the right as you are going up the hill) is a path, really a 4-wheel drive road, with an iron bar with “Gate 14” written on it. That’s the access. Hike in from there, it goes up a way, and when it starts to slope downhill it becomes the traverse you can see on the map. You can see trails coming in from above (to your left) as you hike in. In the winter it was about a 15 minute hike to reach the remains of the lodge. Here's a picture of the old lodge fireplace, from Scott. Just imagine this fireplace roaring in a lodge! Feb 2003. 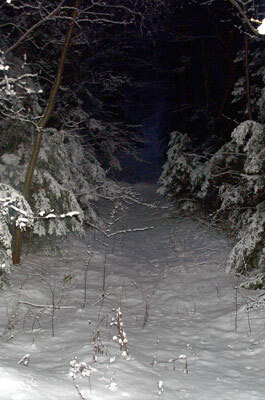 The tow line pictured to the left is the one just past the lodge (lower tow). Just before and above the lodge was a manifold pictured. I’m not sure what it was for. It’s about 10-15 feet long, about 3 feet in diameter, and the outlet pipes are about 10” in diameter. I’ll have to go back again (when there’s more light) and hike up some of the trails to see what else there is to see. A friend told me that she and her family used to picnic there in the 70s and at that point there were still trail signs up. Perhaps there are some up on the mountain. Obviously as this is a State Forest I would want to remind your readers not to litter, I always try to carry out not only my own stuff, but a can or some paper from someone else, leaving the area cleaner than when I went in. 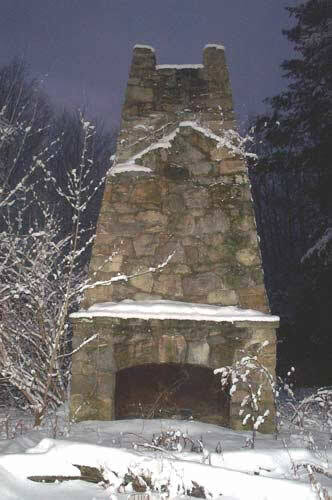 Another view of the lodge's fireplace, courtesy Jon Regan. May 2001. 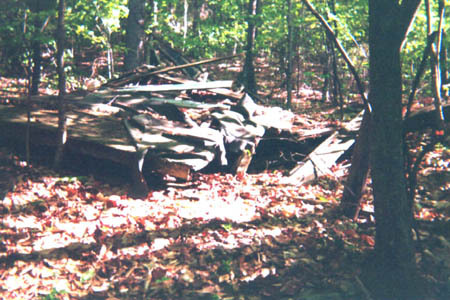 Remains of the motor and wheel housing for the upper terminal of the mid mountain tow. (May 2001) - Jon Regan. Looking up the Polar Trail (main run) from area between the terminus of the mid mtn rope tow and the loading area of the summit tow. Fairly well grown in. However the all runs can be found easily! - Jon Regan. 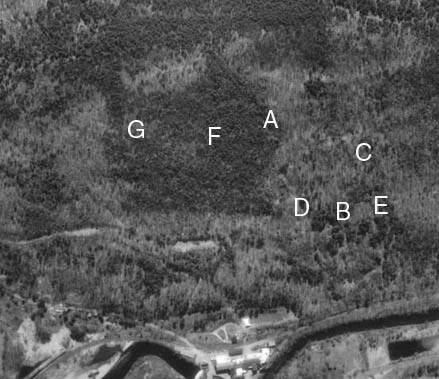 The site of the former ski area, very to make it out, but the upper tow is just right of the cluster of spruce trees. 2002 picture from Jeremy Clark. More closeups of the area, from Jeremy Clark. 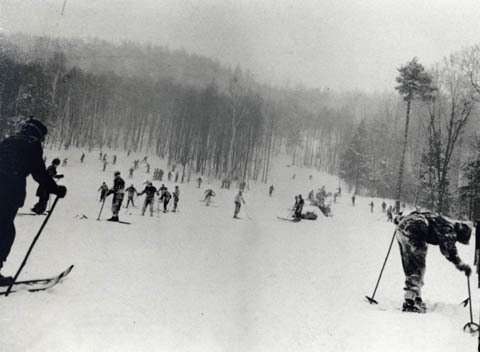 John Schneiter: I skied at Beartown State Forest from 1964 to 1966. I was a student at the now defunct Lenox School for Boys. In the late fall, after football and soccer season and usually just after Thanksgiving vacation, one of our pre-season skiing workouts was to climb the hill at Beartown State Forest. I remember that there was some snow on the ground that made the climbing slippery. We climbed up the outside intermediate trail and would run at full speed down Grizzly where in several weeks we would be in training. After the snow feel, we would take a bus from school up to the mountain and have to climb up Polar which we used for training for Slalom skiing. We would set a course and run it. Usually pretty tight gates. I can remember standing by a rundown lodge at the base of the course and watching team mates coming down. For Grand Slalom and downhill, we would have to climb, in the winter, to the top and switch boots to ski boots. We would use Grizzly for that training. In the trail map on your site, you can see the first turn to the left and then a sharp turn to the right. in between those two was something we called the "teacup" that would tend to push you back on your skis, just before the hard right turn. The problem was that at that turn was a large boulder. It was always a struggle to stay forward and edge to make that turn. I also have a memory of the Nordic guys using a ski jump there, but I see nothing about it on the map. When I drive by that site today, I usually bore who ever I am with about the stories and experiences that took place up there. Tony Goodwin: Beartown, Mass: I skied there in 1965 when my school (Kingswood of West Hartford, CT) skied against Lenox and perhaps another school. At that time I recall the lower tow in operation, but nothing else. I also cannot recall whether the area was open for the general public or whether our hosts, Lenox School, had arranged for the tow to run just for the meet. It really looked like a great area had the upper tow also been in operation. Dan Pascucci: My name is Dan Pascucci and I used to ski at Beartown in the early 60's. I began skiing when I was 12 (1959) and skied there through high school. (Lift tickets were $3-$4 a day). This past summer my wife and I took a hike to the old ski area so I could show her what was left. 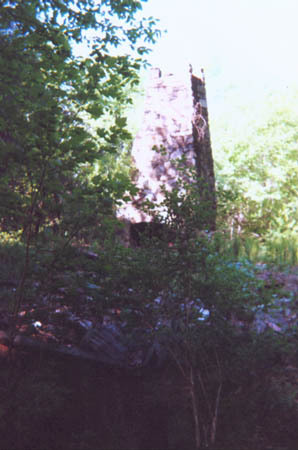 The fireplace to the old lodge is standing and you can still see the old rope tow line. The one thing I remember about skiing there was that the rope tow was really steep and that by the time I got to the top my gloves were almost burnt off my hands from the rope slipping through my gloves. I returned to the Berkshires 10 years ago after 30 years away and each time I pass the area on Rte 102 I have fond memories of my times there and wish that the Mt. had stayed open. I believe that it would have some of the steepest vertical around. My wife and I are Ski Patrollers at Ski Butternut in Great Barrington and pass the area often on the way to our Mountain. I have enjoyed your website immensely. I actually learned to ski at Dutch Hill (another lost ski area). Tom Dwyer: By my senior year I had become an accomplished skier but had never rode a ski lift so a friend and I decided to go to Beartown State Forest in South Lee which had a rope tow and is another of your lost ski areas. As we had no access to conventional methods of transportation we reached it on skis (the bindings in those days could be adapted for either downhill and cross country) by following the tracks of the New York Central Railroad that ran through the valley not far from the school. The distance was about five miles but when we got there we discovered that the place was closed for the day. Undaunted, we climbed to the top and made one run before heading back to school, arriving just in time for dinner. I should point out that in those days Cranwell had a strict rule against leaving the campus without permission which we didn't have and undoubtedly couldn't have gotten even if we had asked for it. As the penalty for such a breach was being expelled we took somewhat of a risk in our futile effort to ride a ski lift for the first time. but from the bottom to the top. We used two trails: one for downhill and one for slalom. It was an excellent area. Never understood why it was not developed.